Today's Flashback Friday wedding was one for the books! And when you see this sweet couple, the amazing florals, the bride's stunning dress, and every other fabulous detail, you'll know what I mean. Seriously, so many great details. This wedding took place just over a month ago, and it was truly over-the-top. We will never forget this one! These photos, taken by Tryston Hines Photography, are just magical. She did a beautiful job at capturing the details of this couple's day, and Monica said the photos helped her to remember parts of her wedding day that are a blur. Monica and Ryan were married at The Barn at Twin Oaks Ranch on October 3, 2015. Their color scheme was absolutely stunning... shades of blush and gold, with navy accents to add a fall touch. They also incorporated rose gold, champagne and ivory. 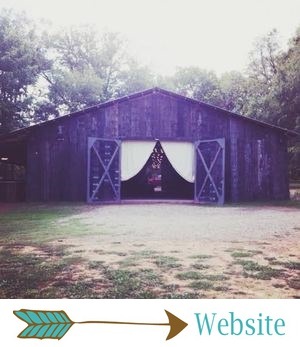 Monica said she wanted their theme to be classic, with a rustic vibe... It was also very glitzy and glam! "I clearly love the color pink and if glitter was a color, it would also be one of my favorites!" she said. "To add a little personality, we did everything over-the-top: the flowers, the glitter linens and the cake." One of the most beautiful details from this wedding: Monica's bridal gown! She found it at Low's Bridal, and my goodness, was it pretty. Seriously, have you ever seen a more gorgeous dress?! I'm also crazy about the details she wore with her dress: pink garters with plenty of bling, gorgeous shoes (again, with plenty of bling), and the prettiest veil we've ever laid eyes on... it had some bling, too. :) SO pretty! Monica, you are such a gorgeous bride! Monica's bridesmaids wore some of my favorite dresses. Like, ever. I'm still a little obsessed with the mismatched bridesmaid dress trend, and these girls nailed it. "I let all my bridesmaids pick their own dress so their personality would show," Monica said. 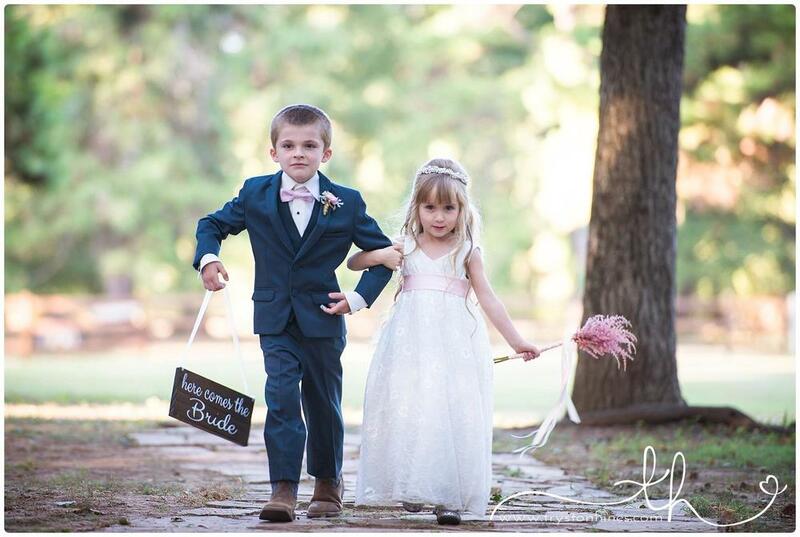 She asked them to wear light pink, floor-length dresses, and they couldn't have turned out any prettier! The groomsmen wore navy suits with blush ties. The perfect colors to compliment the bridesmaids' dresses, as well as the wedding's overall color scheme! This bridal party couldn't be any prettier. One of my favorite looks we've seen, for sure! The details from this wedding that I absolutely cannot get over: those FLOWERS! Oh my goodness. I have never seen prettier bouquets and floral arrangements. "My bouquet was absolutely stunning," Monica said. "In the beginning of planning I wanted something semi-big and very classic (mainly round with nothing sticking out). At the last meeting I completely changed my mind and told Victoria I wanted to go big or go home! My bouquet was HUGE and I LOVED every single thing about it." The bride's bouquet had a few sentimental items tied around it, which made it even more beautiful. She included pictures of her grandparents, who passed away when she was little, as well as her first holy communion rosary. "I can't even put into words how beautiful it was," she said. "It was the first thing I saw when I entered the room. I cried as soon as I saw it." When our floral designer, Ginger, makes our brides cry with her creations... that's when we know she's killing it at her job! The bridesmaids carried small bouquets of roses, ranunculus and astilbe. Some of my very favorite bridesmaids' bouquets! I love the size of these. The flower girl had an astilbe flower wand... so cute! And the pink ranunculus bouts... how sweet and pretty are those?! Before the ceremony, Monica and her dad had a very sweet, special first look. She said she will also remember those moments together. "He cried the whole time!" she said. This sweet couple's ceremony decor was glam, gorgeous and fab-u-lous. A stunning blush and white petal aisle (that thing was covered in petals... completely covered!). A beautiful guestbook table, complete with glittery details. A pallet guestbook made by Monica's maid of honor, which is now hanging in their house! Vintage white doors at the entrance to their ceremony, complete with their initials. A unity candle with the most gorgeous floral arrangement. Pink chair ties, small floral arrangements for the chairs, and mason jars full of flowers lining the aisle. And Monica's favorite detail of the day: that altar! It was draped with glittery, rose gold fabric and had such gorgeous floral arrangements, which matched her bouquet. Stunning! Monica and Ryan's ceremony was romantic, sweet and full of love. Ryan's son, the ring bearer, carried a cute "here comes the bride" sign down the aisle, which was a detail that Monica loved. She said one of her favorite moments of the day was seeing Ryan as she walked down the aisle. "He has never looked so handsome!" she said. Monica and Ryan's reception was, of course, over-the-top and completely magnificent! "I remember getting to see the inside of The Barn for the first time and crying like a baby," Monica said. "Everything was exactly what we wanted. We had a table set up with pictures of all our loved ones who have passed away over the years. The entire reception will always be remembered." Their reception tables included navy linens, sequined chevron runners, mercury glass vases, beautiful floral arrangements, candles, and classic silver and white place settings. The head table had a fabric strip backdrop... so pretty! They also had literally the most beautiful cake ever, made by theCakePlace. Monica said her favorite moments from the reception included getting introduced for the first time as a married couple, dancing with Ryan as husband and wife, her father-daughter dance with her dad, getting to dance with my entire wedding party and dancing with her grandpa. Judging by these next few photos, this reception was a fun one! At the end of the night, Monica and Ryan had a gorgeous grand exit. Their guests threw flower petals as they left The Barn, and it made for some stunning photos! They left for their honeymoon, which Monica said was "the best honeymoon ever." "We went to the Bahamas to an island called Exuma, which was so beautiful," she said. "We stayed at the Sandals on Emerald Bay in a villa for a week. We literally walked out our back door to the beach. While we were there we enjoyed lying on the beach, we got a couples massage, did a little shopping at the local stores, rented a car and drove around the island where we met some really cool people, went swimming with sharks and while pigs, we fed endangered iguanas, and ate some of the best food possible. We couldn't have asked for a better trip!" Finally, I asked Monica to give us some feedback, and this is what she had to say! "You all did such an amazing job; like I have said so many times, everything was perfect. From the very beginning of the planning process, you guys made it so easy, stress free, and fun. I cannot express how thankful and how grateful we are to have had such a great team. If I could do it all over again there wouldn’t be one single thing I would change! Thank you all again so much for everything, every single one of you is truly amazing!!" Weddings don't get more dreamy or gorgeous than this one, y'all! Completely unforgettable.